We have created a custom contact form that is drag and drop, and super simple to use. 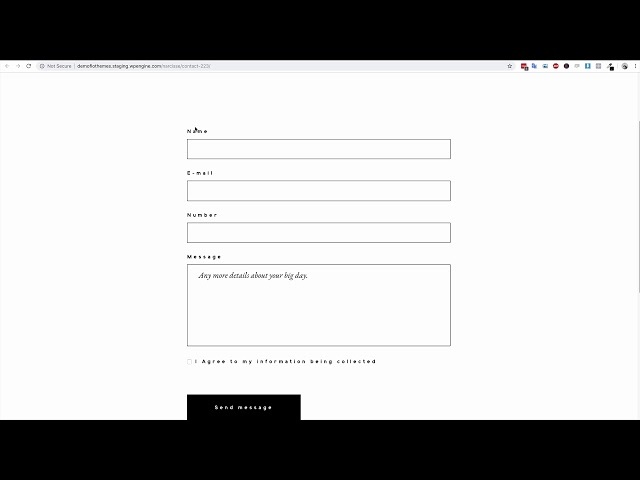 We wanted to develop our own contact form to help prevent issues with email sending, that other contact forms had. FloForms aims to solve this issue. We’ve also added a submissions area, and a settings area that will allow your site to send you a reminder to check your inquiries if you’ve not read them. Textarea – this field will allow a larger paragraph of text, generally used for sections where you require more information. Number – Will add a field that will allow only numbers. Single CheckBox – Is great for options that require a confirmation. CheckBox List – The checkbox list field allows you to add check boxes for your site. This is great if you want to find out some specific information, such as additional services. It allows for multiple selections. Paragraph – It allows to add simple text. Used mostly for informative purpose. Select 50% for the field width tab. To line up another item beside this, follow the same process, select and set to 50%, the items should then line up beside each other. When the message is checked via email, the related Entry will be marked as read automatically. Also there are plugin settings that will affect all the forms. 4) Use an SMTP provider such as mandrill to generate the emails for you, with 99% success rate they are a fantastic way of bypassing the server side issues that can be caused when using WordPress emails. Sign up for a Mandrill account here, generate the API and get started. It also tracks your messages so you can view them in your mandrill account.